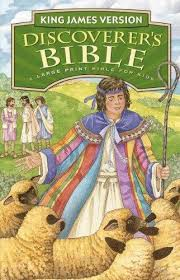 A large-print Bible for kids. The King James Version Discoverer's Bible offers the full text of the KJV translation---just like the one Mom and Dad use---in an easy-to-read, large-print (11.5 point) type. Included are 30 pages of Bible helps and full-color illustrations of important Bible scenes.